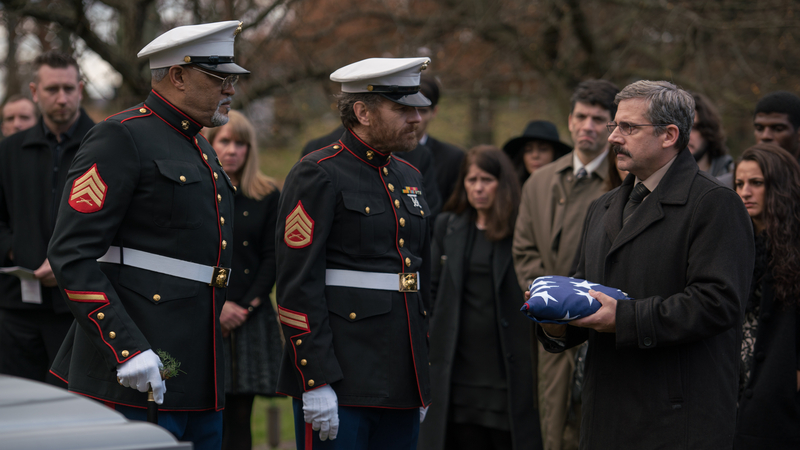 The ever-prolific Richard Linklater is back with Last Flag Flying, a deeply mournful road movie that deals with the sudden loss of a family member in the United States Marine Corps, and the remorse of a past where a tragic accident severs close friendships. One night In 2003, Larry – aka Doc (Steve Carell) – receives news that his son has been killed in action on a tour in Baghdad. Alone, he seeks out two of his old Navy corpsmen to request their company as he takes his son’s body across state lines to be buried in his hometown. We’re soon introduced to the people from Doc’s past, with the first stop being a gloomily lit dive bar owned by cocksure, feisty Sal (Bryan Cranston). Their reintroduction to one another after 30 years apart is wonderfully organic; unsurprisingly Sal doesn’t recognise Doc, and his reaction to an old friend is as genuine as it comes: bewildered, elated and even a little standoffish. Linklater and Darryl Ponicsan’s screenplay (adapted from Ponsican’s own novel) works wonders in this scene by relaying a decades-old friendship in their sympathetic back-and-forth. Their conversation has an effortless fluidity that demonstrates a friendship founded on patriotism to one another, as well as one’s country. After a booze-fuelled lock-in the two hit the road to find the third of their party: the virtuous-yet-volatile Mueller (Laurence Fishburne), whose close-minded fury of the past was extinguished by an understandable path to faith. The literal angel and devil of Doc’s melancholic journey now together, we follow the trio along the East Coast to complete the self-appointed mission Doc has set them. As the wistful core of the trio, Carell continues to show how versatile an actor he is: Doc is a sombre, reserved man whose life has been deeply affected by repeated tragedies, and it’s hard to stem the build-up of tears each time he opens his mouth in pained sorrow. Cranston and Fishburne are also magnificent, bestowing the film with some much-needed humour as the bickering duo clash over their not-so-perfect past. Additionally, J. Quinton Johnson, playing friend and co-corpsman to Doc’s son, perfectly illustrates the pain of a friend’s death, and the forced masculinity drilled into him by edicts and doctrines from his Colonel (Yul Vazquez). It’s not all despondent, thankfully: it can be funny too. Credibly set in 2003 without being flashy, the trio find partnership in their estrangement with the newly flourishing internet, clanging rap music, and – in a particularly funny detour – their purchase of state-of-the-art mobile phones. These sitcom-style digressions don’t add a great deal of poignancy to the completed product, and sometimes they do veer toward the common trope of old people acting eccentric, but thanks to the witty screenplay, rarely do these asides bring the film down to the level of crassness of Sal’s cursing. With his script, Linklater refuses to pull any punches. Take for example, the specific, bigoted rhetoric that Sal adopts when talking about their participation in Vietnam, or the anger each of them express toward the government that’s failing them at each turn. This is a film that doesn’t waver from dealing with American guilt and anti-war patriotism, nor does it try to skirt around the scathing commentary on the lies that fuel wars and the soldiers who die for them. In a notably touching scene, the three visit the mother of a deceased Marine with the intention of revealing the truth behind his death, but instead continue to support the story that her son died a hero. These lies and truths can be hard to come to terms with – the true story weighing heavy on the groups’ collective conscience – but sometimes it’s better to lie than to change someone’s perception. The film’s political stance can get muddied: shots of Saddam Hussein’s son’s deaths drawing parallels to Doc’s bereavement feels a little too broad, and it doesn’t help that the score is widely manipulative. These feel like calculated emotions towards its goal, yet the film could have succeeded in these regards without the swelling chords and sweeping correlations. It’s this lack of discipline in some scenes that is surprising of Linklater, but that does little to negate how poignant and delicate it is when its aim is true. Last Flag Flying is sincere without being saccharine, and while it’s nowhere near peak Linklater, and its narrative feels fundamentally generic, the performances and quick-wittedness propel the film in spite of these slip ups. It’s not a challenging watch by any means – character motivations are apparent, narrative surprises are slim and it isn’t as persuasive as Linklater would like – but it’s an assuredly thought-provoking film that’s earnestness doesn’t drag it into the weeds, concluding with a wholly deserved, humanely warm resolution.